The art exhibition with the above title is on at ModernTwo (The Scottish National Gallery of Modern Art,) Edinburgh until 21/10/2018. 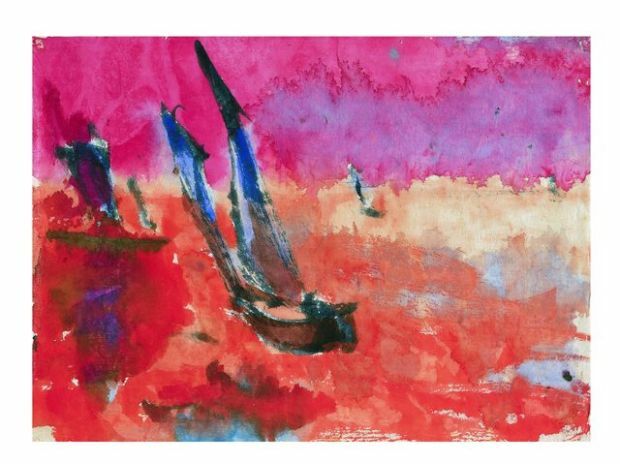 Nolde was born in a part of Germany that became Danish after a plebiscite in 1920 (though had presumably been Danish before the war of 1864) thought of himself as German yet retained Danish citizenship. I noticed at the entrance that the gallery felt it had to emphasise it in no way endorsed Nolde’s anti-semitic views. Despite those views and his membership of the Nazi party Nolde’s works were the single most withdrawn from museums by the Nazis (1,052 works) and the most represented in their Degenerate Art (Entartete Kunst) Exhibition, which managed to draw huge crowds – some of whom were quite enthusiastic about the contents. and his Immaculate Conception (which I cannot find an example of to embed here) showing the mother of Jesus in an attitude of ecstasy as the Holy Spirit hovers nearby is in a similar style only more so. On the other hand some of his pen and ink drawings reminded me of the Rembrandt ones in the exhibition at the Scottish National Gallery.